Make brainstorming and planning sessions more productive with an outstanding bubble map from Canva. A bubble map is a great visual tool for learning as well as for brainstorming and working through complex problems. It works by illustrating a main concept or idea in a central bubble then using lines to connect to more bubbles with related concepts so you can map out the relationships, associations, and parallels between ideas. It’s especially helpful in planning out reports, essays, and even stories. Bubble maps need to be really clear and well-designed, especially if you’ll be sharing your work with other people or even presenting it to an audience or readers. If the thought of designing one fills you with dread, relax! With Canva, you don’t need design experience or much time to come up with a brilliant bubble map design. Thanks to ready-made templates and simple, drag and drop design tools, you’ll be able to create the perfect bubble map in minutes. Create a new Canva account to get started with your own bubble map design. 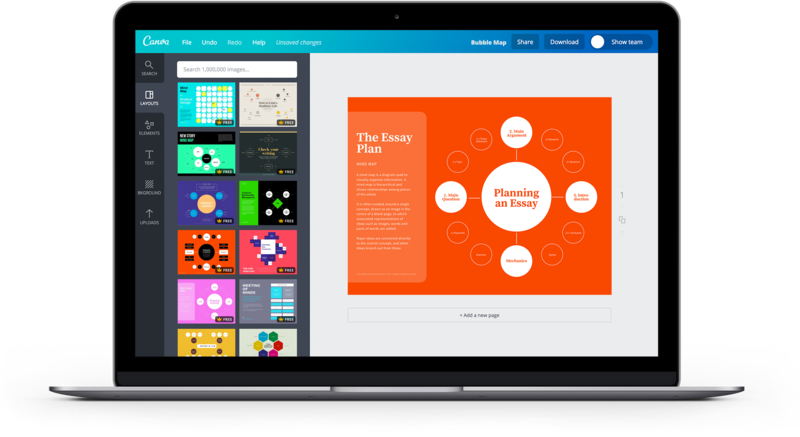 If art or design is not your greatest strength, fear not, Canva was made to make designing amazingly simple. Start by choosing from our extensive bubble diagram library with predefined shapes, lines, and colors. All you need to do is edit the text, resize, recolor or add and delete as much or as little elements as you need. Plus, the large library of icons and images that are ready for use makes it easy to hit the ground running. Swap out some of the text with icons that can represent ideas. You can even drag and drop images into circular frames. A bubble map is an intuitive visualization tool in the way it mimics our natural thought process. You’ll start out with a central concept in the middle of your page and branch out to more ideas, using lines along the way to visualize their inter-connections. While bubble size is often the most important attribute, bubbles may also be defined by their color, position and text description. Thanks to its intuitive interface and drag and drop features, changing an element’s color, position and size will only take a few clicks. Resizing an element is as simple as selecting it then clicking and dragging on any of its edges. To change its color, simply select the object or text, then use the color selector tool found in the toolbar. You can choose from the pre-set design palette or pick any hue from the color wheel tool. Then, make key ideas stand out by using bold or larger fonts. Since bubble maps can be used to brainstorm ideas for reports or papers, you might want to have teammates or colleagues jump in with their own ideas. Getting everyone in the same room, however, can be pretty challenging, especially when you’ve got multinational teams on different timezones and locations. With Canva, collaboration is as easy as clicking the Share button, choosing whether to give viewing or editing access, then sharing the link to your design. Everyone you choose to share the link with can then view or edit your design from any web browser on any computer. Canva is also available for on the go users through our iPhone, iPad or Android apps which are free to download from the App Store or Google Play. How can I format the text on my bubble map design? You can edit your text a variety of ways to make sure it fits your design needs. Using the text tools, you can change the font type, size, color, emphasis, alignment, spacing, and transparency. You can also turn your text into a bulleted list. Changes are applied across all text within a text box. To apply any of the above changes, select the text box you wish to edit and click on the format options found on the toolbar. How can I save my bubble map design? While Canva automatically saves your design as you work, you can also manually save your work by holding Cmd/Ctrl+S on your keyboard or going to File > Save. When all your work has been saved, you’ll see the phrase “All Changes Saved” displayed at the top of your dashboard. This means it is safe to close your browser or window. To download your finished design, simply click on the Download and choose any of the available formats: JPEG, PNG or PDF. To ensure maximum quality for printing, always download your design as a PDF file. Do I need to download or install Canva to create my design? Simply head on over to www.canva.com to start creating your amazing bubble map designs. You don’t need to download Canva, just create an account and log in. If you want to design on the go, download our iOS and Android apps. They’re free to purchase from the App Store or Google Play.